We send our best wishes for the holiday season. We hope your year has been happy and healthy. 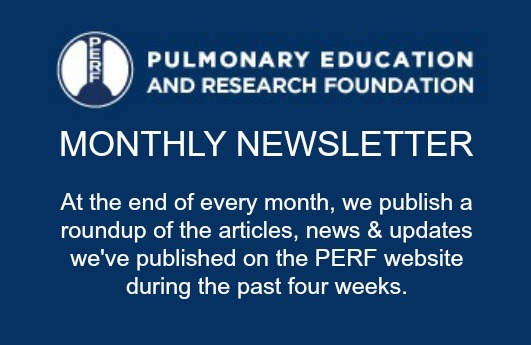 As has been our tradition, this is the time of year we update you on our work on behalf of COPD patients at PERF, the Pulmonary Education and Research Foundation. PERF has been in existence for about 33 years and I’m proud to say that this year’s progress is a match for any of them. Have you subscribed to PERF’s blog? If so, you’re one of over 1,000 people! This year, our subscriber base has increased almost threefold. We’re gaining traction with the COPD community, providing weekly messages that span the range from helpful hints to the latest research results. Ann Voorhees Baker, our webmaster, has done a marvelous job, taking the lead in composing the blogs and managing PERF’s website and social media activities. Mary Burns and Janos Porszasz have provided major support and yours truly has served as the chief editor/proofreader. Please see what we have to offer on the main website (https://www.perf2ndwind.org). While there, don’t miss visiting the newly established Blog Site (http://blog.perf2ndwind.org), and click on the “join our mailing list” link to sign up for the weekly blog. As part of our continued efforts to serve pulmonary patients – the Education aim of our foundation – we established a patient forum this year, the ‘PERF Better Breather’s Club’, which has hosted 8 seminars on topics ranging from emergency preparedness to nutritional strategies for patients with lung diseases. These seminars are open to all and also provide an opportunity to meet with our doctors and researchers over coffee and cookies. Thanks to Harry Rossiter, Mary Burns and Kurt Antonius for getting this program running. If you sign up for the blog you’ll receive an announcement of upcoming seminars. The Rehabilitation Clinical Trials Center continues its work efficiently. We’re enjoying our rather elegant space in the Chronic Disease Clinical Research Center (CDCRC). Our cadre of 8 study coordinators and laboratory support folks facilitate efficient research. The four key investigators continue to be hyper-busy. We work as a team, but we all have our special focuses. William Stringer juggles his clinical duties at Harbor-UCLA Medical Center and his aggressive program of COPD research. As Medical co-Director of the Rehabilitation Clinical Trials Center, he heads several clinical trials, one evaluating a new bronchodilator’s effects on exercise tolerance (and the mechanisms of this effect), and the other seeking to find important COPD biomarkers. He continues to push for establishment of a unique pulmonary rehabilitation program for the underserved Harbor-UCLA population, but is meeting resistance from the hospital, but mainly from the Los Angeles County bureaucracy. While he attempts to unravel the red tape, Kris Brust, RN, and her cadre of nurses-in-training from Harbor College have very generously volunteered their time to run a twice-weekly maintenance exercise program in the CDCRC for those patients with lung diseases who have poor access to exercise facilities or require supplemental oxygen. In the meantime, Dr. Stringer has opened up a second front, proposing a rehabilitation program for patients who are awaiting surgery, seeking to improve their post-operative outcomes. PERF has contributed to outfit our rehabilitation facility with state-of-the-art exercise machines and monitoring devices. Harry Rossiter continues as Director of Research Training. He’s led recruitment efforts that have yielded a stream of excellent PhD-trained postdoctoral fellows (see below) who are an important part of the engine driving our research and will be part of the next generation of research professionals. His research continues to focus on muscle function in COPD. This year, he completed a study of ~250 people, including patients with varying severities of COPD, to look at the interrelationship of physical activity and genetic factors that contribute to muscle dysfunction in COPD patients. This research will help us learn (at long last) why COPD muscles don’t work very well. He continues his studies on the determinants of muscle fatigue during exercise in COPD and is in the middle of two studies looking at strategies to decrease fatigue and improve exercise tolerance. He has taken on the leadership of a study looking at a novel drug that has the potential to increase skeletal muscle force in response to the brain’s commands and to delay the onset of muscle fatigue. Recent plans call for exploration of how blood metabolites are altered by exercise in COPD compared with healthy controls. Janos Porszasz continues to keep our flagship focus, exercise testing, firing on all cylinders. Exercise testing lets us determine how much and (more importantly) why diseases such as COPD impair exercise tolerance. Dr. Porszasz continues to develop novel methods to improve the diagnostic capabilities of exercise testing. One approach has been to study the breath-by-breath course of exhaled gas flow during exercise to gain insight into changes in airway function. In another study, a non–invasive device clipped to the ear has been shown to make measurements heretofore only obtainable by blood sampling, providing an important assessment of lung efficiency during exercise. Grants from the PERF community have provided new equipment that (we hope) will yield new ways of assessing the effect of therapy on lung function. He plans to study the function of the lower airways by a non-invasive, effort independent pulmonary function testing method with the help of international research fellows. For my part, I’m in my 24th year as President of PERF and 16th year as Grancell/Burns Chair in the Rehabilitative Sciences. I have a good number of irons in the fire. I continue to oversee the COPDGene study at our center. This study started in 2008 and we’ve recently finished seeing ~400 of the original ~750 participants on the 5th anniversary of their initial visit. With the help of a renewal grant from the National Institutes of Health, in a few months we’ll begin seeing the participants at the 10th anniversary of their first visit. This study has been fantastically productive; over 250 research papers have been published so far, yielding important insights into a wide range of COPD-related topics (including, of course, genetics). I continue to serve on national and international panels seeking to improve COPD-related guidelines and promote new ways of evaluating COPD therapies. I travel a lot, accepting speaking engagements on COPD-related topics in the United States and abroad (in Italy, Poland, Turkey, Israel, and England this year). But my most exciting project is PROPEL, a proposal to conduct a study to see if pulmonary rehabilitation prolongs life. This is important; because therapies that prolong life have high societal priority… such a demonstration should yield wider availability. I’m part of a three-investigator team that is proposing a 2000-patient 7-year study to the National Institutes of Health. Wish us luck! We’ve continued to recruit a cadre of very fine trainees enabled by funds generously provided by Alvin Grancell. Dr. Alessandra Adami is finishing up her time with us and will leave soon for a faculty position at the University of Rhode Island. Dr. Krisztina Marosi left us to take up a position at the UCLA Brain Research Institute to work on new projects in Alzheimer’s disease. Dr. Asghar Abassi recently came on board; his expertise in immunology will prove an asset in our mechanistic studies of exercise training responses. We continue to have a flow of visiting scientists from here and abroad, most recently from Turkey, Italy, China, Taiwan, Thailand, Germany, UK, México, and Brazil. We maintain contact with scores of researchers and clinicians, who have received training in our laboratory and then returned home and are enhancing COPD and rehabilitative practice. Our core group of PERF founders remains active. Mary Burns and Alvin Grancell (who celebrated his 98th birthday recently) remain strong supporters of the research in the Rehabilitation Clinical Trials Center, as well as a range of other activities, donating money through PERF to support its activities. Seed funding for research projects has yielded important results and, in some cases, has attracted larger governmental grants. I also need to acknowledge three special people who have been with PERF just about from the beginning. We value the assistance we receive from Jean Hughes, our treasurer and Pete Pettler, our legal advisor. They help us to perform our duties as a non-profit corporation and keep us out of trouble! Brian Tiep, with his partner Mary Barnett, continue to provide a model of patient-focused care in their pulmonary rehabilitation practice. Pulmonary rehabilitation funding has been a major concern for years. Chris Garvey has been among the small cadre of people nationally who have tried to influence the Medicare folks to increase the abysmally low reimbursement rate for pulmonary rehabilitation services. She and I have tried to craft an editorial explaining the nuances of the determinants of Medicare reimbursement. The system is bizarrely complicated; but a current focus is on getting hospitals that offer pulmonary rehabilitation services to bill Medicare appropriately. Wish us luck in formulating a cogent explanation and getting some movement on this important issue. Kurt Antonius, who joined the Board a few years ago, continues to make inroads as the person driving our Public Relations efforts. His work has been especially gratifying in that he has re-established strong ties with the PEP Pioneers, the support group for those who have participated in the Little Company of Mary pulmonary rehabilitation program, which Mary Burns founded. Kurt initiated PERF’s first and so far only public fundraising campaign whose goal was to raise $10,000 for a spirometer that is being used for a PERF-funded COPD Registry screening program. Another piece of equipment that records heart rate and pulse oximetry during field walking tests was also purchased from these funds. A big THANK YOU to all those who contributed to the success of this effort. We have two new members since I last wrote. Dr. Ronald Oudiz is an expert in pulmonary hypertension and directs an active research laboratory on the Harbor-UCLA campus. His interests add new dimensions to those of the other Rehabilitation Clinical Trials Center investigators. Mrs. Anita Gash recently retired from a long career in academic administration… and is a COPD patient. She is already providing help with our blog and hopes to publicize the work that PERF does. This is the part of the letter where we ask for your support. This is our annual appeal for your donations: if you think PERF is a worthy cause, please consider contributing for the benefit of the COPD community here and worldwide. Our overhead is very low. I can assure you that your donation will be used efficiently to promote research and education in the fields of rehabilitation and COPD. We know how to squeeze every last cent out of your dollars! All of our Board members contribute their services; none is paid for the work they do. Your donations are fully tax-deductible and will be gratefully acknowledged in writing. We hope to hear from you. Click here to visit our donation page. There you’ll see a green “Donate” button in the upper right corner that you can click to donate directly online, or if you prefer to mail in a check, you can follow the instructions on the page.